So the world around us is continually changing and we have to adapt to it. Of course, it’s stating the obvious, however, given the impact on us, particularly at work, we need to be able to adapt effectively. This is also true in tennis, both in the men’s and women’s games. Advances in technology together with efforts to mitigate these have changed the game beyond all recognition. Just over a decade ago in men’s tennis there were consistent complaints that on faster courts the game was boring, with big servers dominating and rallies being short. Of course, this also helped make the game more attractive on clay, where players still had to work the point out but points were at times shorter. It’s illustrative to look at Federer’s career, as he emerged in an era of big serving and has remained at the top, setting records galore and never being out of the top four over the last 10 years. He was first seeded in a grand slam (15 at Wimbledon) in 2001. It was then that he beat Sampras – a tournament where those who played serve and volley tennis tended to dominate – the final that year was between Rafter and Ivanisavic, one of the finest serve and volley players against one of the biggest servers. In 2001 Federer consistently came in to the net behind his first serve, as he did when he first won Wimbledon in 2003, playing a similar style as he started to dominate the men’s tour in 2004. By 2006 he was barely coming to the net behind his serve, in the Wimbledon final, his first against Nadal, he came in behind his serve a mere five times (less than 5% of serve points). Additionally, changes have occurred to both balls and playing surfaces, which have pushed Federer and others to make changes. 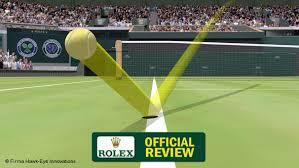 The ITF has sanctioned three different types of ball since 2002. These are the standard ball, a harder ball, designed to play faster on slower surfaces and a slower ball, six percent larger than the standard ball. All are designed to leave the racket at the same speed but the slower ball will lose speed in the air and again following the bounce. The slower ball of course gives the receiver a much better chance of making the return. I don’t think it’s coincidence that the game has been dominated in recent years by four players with exceptional returns of serve. While there were rumours that Wimbledon had changed the type of grass in the nineties to slow down the game, it was definitely true that the surface became slower in the 2000’s. The difference in pace off the court between Federer’s first win in 2003 and his loss to Nadal in 2008 was demonstrated by a graphic used by the BBC, where, using Federer as the example, it showed how much more time the receiver had on serves hit at the same speed. For Nadal playing on grass became more like playing on a medium paced hard court. This trend has coincided with the demise of serve volley tennis, other than by a few journeyman players (Llodra, Mirnyi) and the dominance in the game of supremely fit athletes with pinpoint accuracy from the baseline. So how has Federer responded, as a player who initially emerged as an attacking player?Firstly, as mentioned above, he has developed greater confidence in his baseline game. Adapting to the slower conditions at Wimbledon and elsewhere early in this period of dominance and unable to finish points as quickly, he improved his ability to create angles to enable him to work out the points better. Over the last five or six years he has increasingly been challenged by what are now the other top four players (though Nadal is currently at five due to an extended absence through injury). Nadal, Djokovic and Murray all play predominantly from the back of the court, are quick and are exceptional returners of serve. They all tend to play deep, that is from well behind the baseline. So with advancing years what has Federer done? You might think he would play from further back to give himself more time. However, this is contrary to his natural attacking instincts. In fact on hard courts and grass he seems to have stepped in a little against his main rivals. This is a higher risk strategy, in that when they hit the ball deep he needs to take the ball just after the bounce. Indoors and in good weather conditions on a hard court this can work, if you have the exceptional hand-eye co-ordination that Federer has but in windy conditions, or on grass, where later in tournaments the baseline gets chewed up, there are more likely to be bad bounces leading to potential mishits. It does have a major advantage, taking time away from his opponents and giving them the type of opponent that they will only ever face when they play him. It also has the potential to shorten the points, which is again an advantage for an older player. Federer has made it work, 2012 saw him return to number one and win his 17th grand slam at Wimbledon. He’s looked at how the environment he’s operating has changed and the players who are challenging him and worked out what he considers is the best way to adapt his style of play to the challenge. We also need to think about how we need to adapt our skills to the environment we find ourselves in.